Around the world actions are being organized to remember the 25th anniversary of the Chinese Pro-Democracy Movement and the crackdown and massacre that began on the night of June 3, 1989 and continued through the day of June 4, 1989. Chinese dissidents have been and continue to be rounded up in a preemptive manner to silence them in what Human Rights in China has described as an "Enforced Amnesia" and others have described as a cover up or a blackout. Below is my small contribution in remembrance of the courageous students who perished or were imprisoned on that day. In June 1989, the Chinese novelist Ma Jian was among the million freedom protesters who gathered in Tiananmen Square and survived to give his testimony. 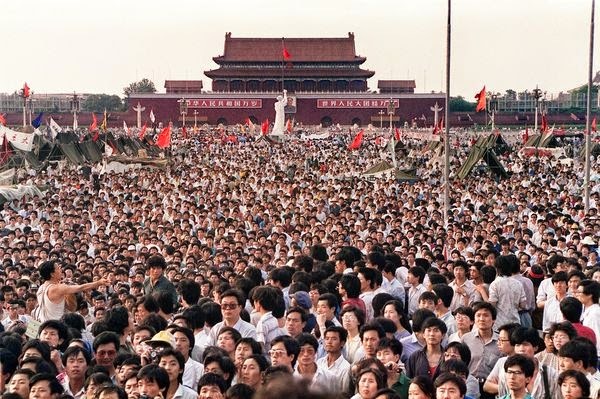 On 4 June 1989, when the Chinese Communist party (CCP) sent 200,000 soldiers in armoured tanks to suppress the peaceful pro-democracy protest in Beijing's Tiananmen Square, causing hundreds if not thousands of fatalities, it was unimaginable to me and most of my compatriots that, 25 years later, this barbaric regime would still be in power, and the massacre would be rendered a taboo. But despite the party's most ardent efforts to wipe the episode from history, memories of the massacre refuse to be crushed. On the milestone 25th anniversary, Tiananmen is more important than ever. Tiananmen revealed the true face not only of the Chinese people, but of the CCP as well, which was exposed as a regime prepared to massacre its own unarmed citizens in order to maintain its power. It is both mistaken and morally repugnant to argue that the deaths were necessary to "re-establish order" and guarantee future growth. Taiwan is clear proof that the Chinese can successfully combine democracy with capitalism. China's rapid economic rise over the past 25 years is thanks in most part not to the Communist party but to non-unionised Chinese workers prepared to labour in poor conditions for low wages. An accountable, democratic government would have no doubt achieved a less frenzied, more sustainable economic rise, with less corruption and environmental devastation. Until now, the only apparent victor of Tiananmen has been the CCP. The massacre destroyed its moral legitimacy, but like a resilient virus, it has mutated in unforeseen ways to ensure its survival. Hard to believe that 25 years have passed since hundreds of thousands led by Chinese students gathered in Tiananmen Square beginning in April demanding an end to corruption and democratic reforms only to be massacred by the Chinese regime beginning on the evening of June 3, 1989 continuing into June 4, 1989. Estimates of the number killed ranges into the thousands. The Chinese Red Cross had initially reported 2,600 but then quickly retracted the number under intense pressure of the government. At the time I was a student at Florida International University and seeing Chinese students taking to the street in Miami to march in solidarity with their counterparts back in China, inspired me and I joined with them. Reading the account of what transpired during the Chinese democracy movement protests by Kate Phillips, an American teacher living in China at the time, brought back the memory of those days for me. Saddened and outraged at the time by the U.S. policy of collaboration with the Chinese communist regime that had been formalized with the normalization of relations in 1979 and secret visits to China following the June 1989 massacre to assure that business would continue as usual only increased my sense of shame with U.S. foreign policy and its moral implications. As a Cuban American it is doubly painful to know that the regime in Cuba was one of the few voices around the world to publicly praise the massacre of Chinese students in 1989 and has been a permanent voice advocating harsher treatment for human rights defenders in China. Tiananmen Mothers, a group of family members of some of those killed during the violent crackdown on the 1989 Democracy Movement produced a short documentary: "Portraits of Loss and the Quest for Justice"in which the stories of six victims are told by their family members, and two survivors provide their own testimony. It can be viewed online here. Initiatives for China has proclaimed June 4, 2014 as a Global Prayer Day for China and have obtained the support of Arch-Bishop Desmond Tutu and Former Taiwanese President Lee Tenghui. The prayer is available online here. Please share this post with others and do your part in resisting censorship by remembering the victims and their sacrifice for freedom.